In need of some comfort food, I’ve got the perfect dish. 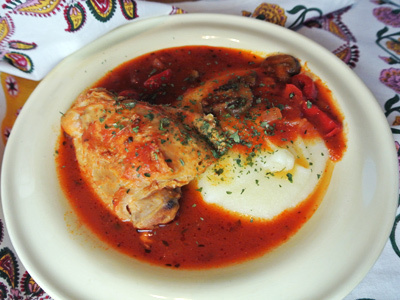 A bowl of chicken cacciatore with some creamy polenta will make you feel right at home. It’s one of the most flavorful dishes you could make and the chicken practically falls off the bone. 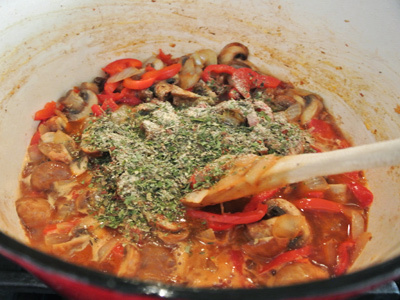 So easy to make, everything goes together in a dutch oven to simmer for 30 minutes to an hour. I love it with a side of creamy polenta but it depends on the mood. 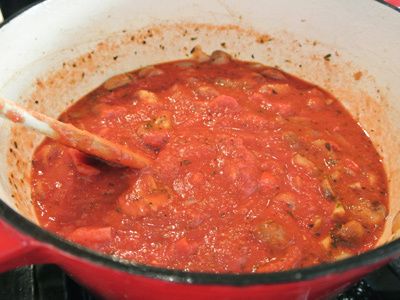 The spicy tomato gravy is so delicious you can pair it with pasta, rice or even mashed potatoes. You’ll need 8 pieces of chicken (legs and thighs), a chopped onion, red bell peppers, Baby Bella mushrooms, crushed tomatoes, red wine, blend of spices and brown sugar. Heat a dutch oven and drizzle a bit of olive oil over the bottom of the pot. Sprinkle the chicken pieces with salt and pepper then add 4 pieces at a time to the pot. Brown about 4 – 5 minutes on each side. I removed the skin from the thighs to reduce the amount of fat and grease. Once you have all 8 pieces browned, remove from the pot and set aside. 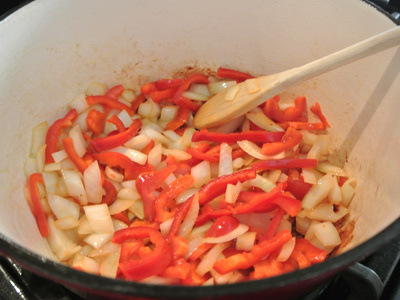 Add the chopped onion and red bell pepper to the pot and stir. When the onions and peppers begin to release their juices, begin scraping the bottom of the pot to loosen up those crusty chicken pieces. 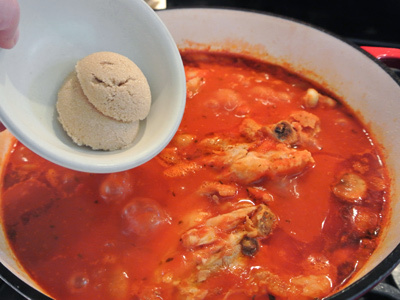 This will flavor your cacciatore even more. 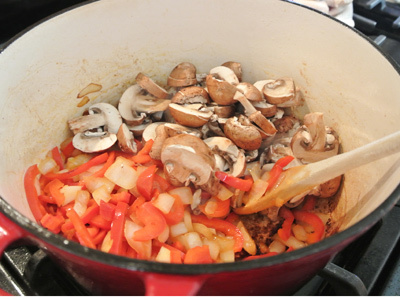 As the onions and peppers begin to sweat it out and become translucent, add in the mushrooms and stir the pot. 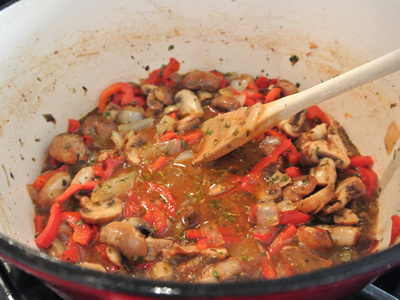 Let the mushrooms cook down 2 – 3 minutes. Next comes the grated garlic. Stir it in with the rest of the vegetables. All the vegetables have cooked down and ready for some wine. Pour in 1 cup and stir the pot. Bring the temperature up to a boil and let the liquid reduce by half. Mix together the spice blend of salt, basil, parsley, oregano, thyme, onion powder, garlic powder, white pepper, black pepper and red pepper flakes. Pour the entire contents into the pot and stir. Looking really tasty, but there’s more to come. 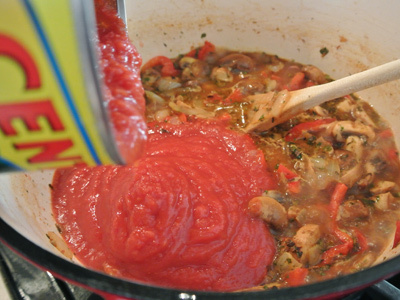 Add the crushed tomatoes to the pot. Stir the pot and let it heat up slightly. Time to add the chicken back to the pot. The chicken needs to cook throughout as it was only browned on the outside. Place the lid on the pot and let simmer over medium low heat for 30 minutes to 1 hour. You could slow cook the chicken for even longer if you wanted to. About 15 minutes before you are going to serve the chicken, add the brown sugar to the pot. This gives just an added bit of sweetness to balance out the spice. Return the lid and continue to simmer for 15 minutes. 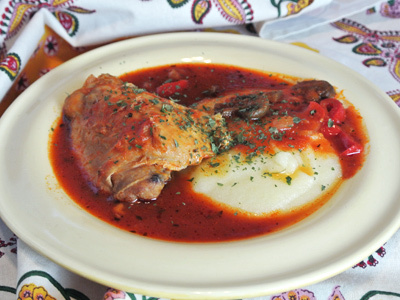 The cacciatore will be perfect in the amount of time it takes to make your side dish. Grab a bowl and ladle some polenta, pasta, rice or mashed potatoes. Add a piece of chicken on the side and ladle spicy tomato gravy over the two. Combine the seasoning mix together in a small bowl, set aside. Heat a dutch oven over medium high heat and drizzle olive oil to coat the bottom of the pot. Sprinkle the chicken with salt and pepper. 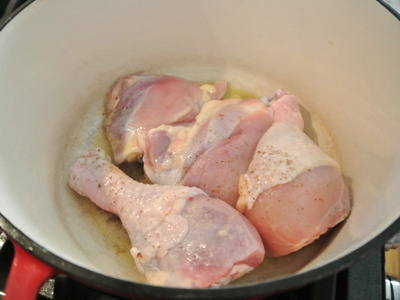 Add the chicken pieces, 4 at a time and brown 4 – 5 minutes on each side. Repeat with remaining chicken pieces. Remove to a plate lined with a paper towel. 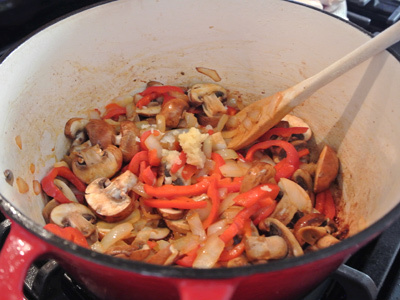 In the same pot, add the onion and red bell peppers. 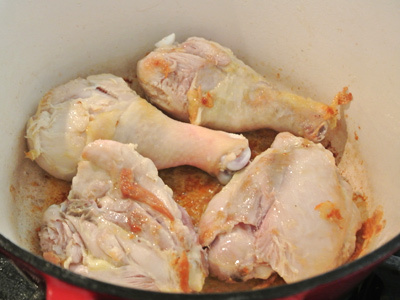 Stir the pot and begin to scrape up any crusty chicken pieces from the bottom of the pot. 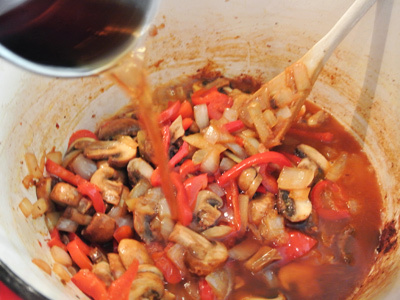 Let cook 3 – 4 minutes and when the onion and peppers begin to soften and become translucent, add the sliced mushrooms. Continue to saute the vegetables another 2 minutes then add in the grated garlic. Pour in the red wine and turn up the heat to a boil. When the liquid has reduced by half, add in the crushed tomatoes and spices. 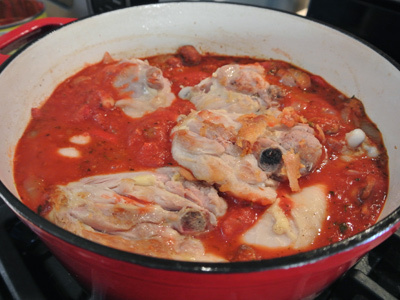 Add the chicken pieces back to the pot, reduce the heat down to simmer and place a lid on the pot. Simmer over medium low heat for 30 minutes to 1 hour. About 15 minutes before you are ready to serve, add the brown sugar to the pot and stir. Replace the lid and let simmer another 15 minutes. 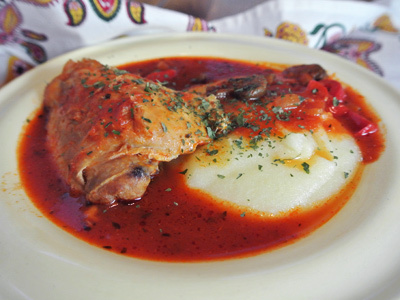 Serve chicken and sauce over polenta, pasta, rice or mashed potatoes. I haven’t made this is so long…your photos convinced me I must make again soon. I agree about serving it over polenta too. 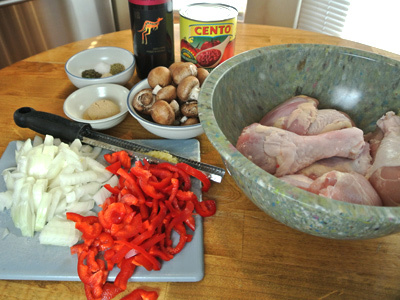 It’s been awhile since I’ve made chicken cacciatore too! You may be surprised at how much you missed it, at least I thought so. Enjoy! I made this for my wife and in-laws. She is a very good cook and she wanted the recipe she thought so highly of it, I also added some capers and some olives cut in half near the last 40 minutes it was excellent thank you. I also cooked it for additional 45 minutes until the chicken was tender. Thank you for your kind comments. I’m so glad you all enjoyed the Chicken Cacciatore. We think this is one of the best comfort dishes and perfect for serving family and friends.